Michael Herdina grew up in Anchorage and has spent more than 50 years skiing and exploring the mountains alone. He’s well aware of the advice that you should travel with a partner but admits, that rarely happens. For close to 20-years I was his most frequent partner but since I fell skiing and hurt my hip four years ago, I haven’t been able to go as often. He has a few friends he skis with but most days he prefers to travel alone at his own pace. “I don’t like to wait for people,” he said. “Or maybe you could say, I just don’t play well with others,” he chuckles at his joke. For more than a decade he’s spent time each winter exploring the terrain around Wolf Creek Ski Area in Colorado. There is a lot of backcountry skiing at this small, family resort and Herdina has grown familiar, and reluctantly admits, a little careless. Recently he’s had a couple of close calls where he realized a partner could have been a great benefit. One day he skied into an area that turned out to be a range of steep cliffs with a series of waterfalls. He tried to stop when he realized where he was, but he was moving too fast and caught his ski on a rock that launched him headfirst down the hill. He landed on a broken off tree stump that jabbed him painfully in the back. I remember one skiing adventure with him when we met up with a group of other skiers about our age and ability. Because I generally only ski with Herdina, I was thrilled with the idea of skiing with other people, especially women. I happily followed the group, but when we arrived at the lift, Herdina was nowhere to be seen. I spent the next four hours trying to find him. When we finally reconnected he said he just likes picking his own line and took a wrong turn that separated him from the group. Whether it happens by design or accident, being alone in the wilderness takes special considerations. Joe Royer, a 40-year veteran helicopter ski guide based in Lamoille, Nevada, understands the reasons and challenges of traveling alone. But, he advised, following careful protocols and always sticking with your plan can mitigate a lot of risk. Other advice Royer shared included: communicate your plan with someone you trust and then follow it. And don’t explore new places during high hazard times. That made me think of my friend Herdina. 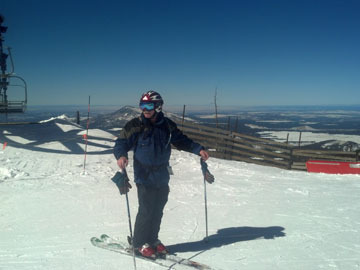 He recently called me to tell me he’d learned another valuable lesson about skiing alone and knew he needed to scale back his risk tolerance. Wolf Creek had received over five feet of snow in a storm and Herdina was alone and happily plowing through the trees in waist deep powder when he caught a ski on a branch. It popped his ski off and sent him crashing headfirst into a tree-well. Snow filled his nose and mouth and he found himself trapped and struggling to breathe and fight off the rising panic. “My ski was literally pointed straight at the sky and wedged against the tree. I was folded in half and hung there stuck. I kept struggling to flip myself around.” Only a few hundred feet from the lift, he thought about calling for help but figured either people wouldn’t hear him or might think he was joking around. And he admitted, he was embarrassed by his predicament. He was prepared to accept he’d gotten himself into this predicament and would figure a way to get himself out. It took more than 20 minutes of wiggling, wrestling and resting before he was able to reach his binding and pop out of his ski. Lucky for him, the incident left no scars and only another reminder that a partner could be a good asset. I remember an incident at Alyeska Ski Resort when two young boys were boarding together during a snowstorm. The boys got separated and one fell into a tree-well similar to Herdina’s situation, only he wasn’t able to get himself out. His friend tried to find him but was unsuccessful and in the end, instead of just a lingering memory to warn of the potential danger, the story ended in tragedy. Whether you plan to travel alone or just find yourself in that situation, it pays to go prepared. At the minimum carry some type of communication device, make sure you stay alert and aware, and tell someone who knows the general area where you will be and when you expect to return.